Open: April - October... The hotel has been elegantly designed with comfortable accommodations and a wide range of facilities up to a good 5 star hotel. Porto Platanias Beach Resort & Spa promises you a holiday experience of the highest quality and ensures a satisfying and memorable stay! A friendly, warm and welcoming ambience is the driving philosophy underlying Greek Hospitality, as well as the own sense of hospitality. The hotel is characterized by its elegant and functional spaces, the hospitality and friendliness of the staff and meticulous care for detail. All of these qualities contribute to establishing Porto Platanias as the ideal place for memorable, dreamlike vacations. All of the hotel rooms are designed and furnished with the highest aesthetic standards and all the spaces exude a unique Style and Quality. Next to the central building, you will find a very warm cluster of exquisite, fully refurbished apartments, studios and maisonettes of Porto Platanias Beach Resort & Spa that feature a unique architecture, finesse, and high quality amenities and services. Nestled in lush green and featuring a spectacular view of the Cretan Sea and the island of St. Theòdori (Thodoroù) it combines all facilities of a five-star resort. Enjoy endless moments of carefree relaxation next to the magical swimming pools and take advantage of the unobtrusive service and the hospitable ambience of the Hotel. Porto Platanias Beach Resort & Spa should become your reference point for your own private tours and travels through the endless vistas of the surrounding area as well as of the entire island of Crete. 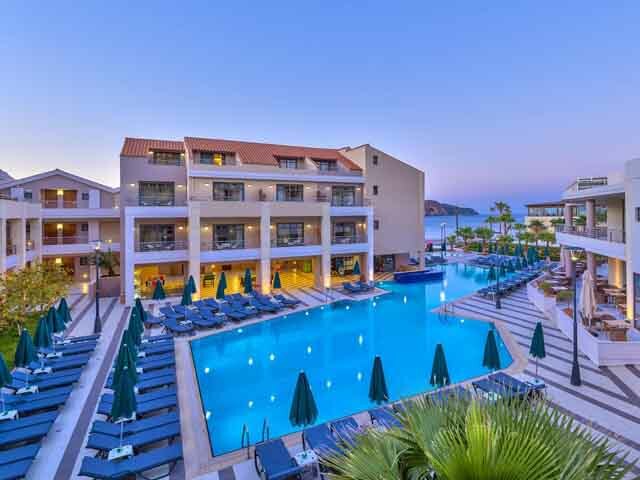 Porto Platanias Beach Resort & Spa is elegantly designed and features comfortable accommodation and a wide range of facilities and amenities that are impeccably combined for the ultimate holiday experience. The pool or the garden. Standard Rooms (2/3 persons):twin beds, or double bed, two bedside tables, Desk and Chair, Coffee Table and two chairs, with sea front view or side sea view, pool view or garden view. Family Rooms (2/4 persons):a spacious bedroom featuring twin beds and a wooden partition separating it from the living room which features 2 sofa beds and a terrace overlooking the garden. Living Room: Separated by wood and galss door, one Convertible Couch, Balcony with Table and two Chairs. Baby cot available. Family Rooms with private pool (2/4 persons):a spacious bedroom featuring twin beds and a wooden partition separating it from the living room which features 2 sofa beds and a terrace with a private pool and a mountain or garden view. Maisonettes (2/4 persons):split-level rooms comprising a living room with 2 sofa beds on the lower level and a twin-bedded room on the upper level communicating with each other by means of an internal wooden staircase. They feature a large marble bathroom with a separate shower and bathtub, as well as a balcony with a pool view or garden view. Standard Suites (2/4 persons):a bedroom and separate living room with 2 sofa beds, a mini stereo with CD & cassette player, sophisticated furniture and extra facilities. They feature a marble bathroom with Jacuzzi and Hydro Massage Bathtub, large balconies with sea view or pool view. The biggest suite in 80 m2 .It consists of 2 bedrooms,one with king size bed a, dining room with fully equipped kitchenette and a living room with extinguished furniture ,2 couches and a big balcony .It also has 3 luxurious marble bathrooms , one with hydro-massage & extra facilities as well as DVD player , CD player and extra services . One comfortable suite in 50 m2 .It consists of one bedroom with king size bed a, dining room with fully equipped kitchenette and a living room with 2 convertible couches and a big balcony .It also has 2 luxurious marble bathrooms with hydro-massage & extra facilities as well as DVD player , CD player and extra services . *During meals, Soft drinks, Local wine (white-rose-red), Local Draft beer & juices, water are included. *Drinks are on self service basis and every guest can take one drink each time. *Early breakfast and lunch basket upon reservation till 20:00, one day before at the reception desk. *Late Arrivals: we offer cold plates in the room. Fruit juices, Local Draft beer, Local spirits (Ouzo - Raki), Local alcoholic and non alcoholic cocktails, variety of coffees, tea and other refreshments, purified water. *Fresh juices, Champagne, Brand spirits, Bottled wines with 30% discount from our catalog. *July-August-September: Melon & Water Melon every day. *Drinks and food are on self service basis and every guest can take one drink each time. Soft drinks, Fruit juices, Local Draft beer, Local spirits-Oyzo-Raki- Local brandy , Local wine ( glas red-white-rose ) ,Alcoholic and non alcoholic cocktails, Gin , Vodka , Whiskey , Rum, Tequila , Long drinks, variety of coffees , tea are included . *Import & Premium Drinks such as Labeled Gin, vodka, tequila, rum, whiskey, and champagne, with 30% discount from our catalog. Offering a big variety of International branded alcoholic drinks, Coctails, Long drinks, Beers, Bottled wine, Coffees, Fresh juice, Champagne . Every Thursday Greek Night with buffet, barbeque, live music and folklore dance is organised at “Ikaros” roof garden bar. *AI guests may participate to our Greek night with a supplement (drinks are not included). *Wine, import & Premium Drinks such as Labeled Gin, vodka, tequila, rum, whiskey, and champagne, with 15% discount from our catalog. The facilities available at Porto Platanias Resort combine all the essential conditions to make any social or professional event a total success! Easy access to hotel restaurants, bars etc. Mini club for Children from 5 until 12 years old, English Speaking Animators, Children’s playground, , drawing, table games, water games in Children’s Pool. Daytime animation programme incl. games, sports and competitions. Evening entertainment at the lounge or roof garden bar incl. 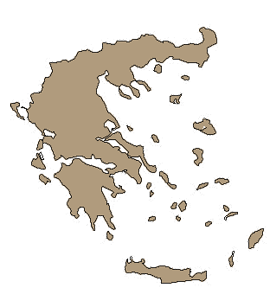 Greek Nights, once a week, "Theme" Nights, twice a week and other music nights.